Standing on guard at the junction of the two wings of the museum is a bronze statue of Adam Sedgwick. He stands at the transition between the younger Mesozoic rocks, with their ammonites and marine reptiles, and the older 250 to 540 million year old Palaeozoic rocks, the mysteries of which he did so much to unravel. In one hand he holds his trusty geological hammer. With the other he seems to be offering the visitor a view of a fossil on a piece of shale – “Here! Come at look at my fossil”. If you do as he asks, you will see he is holding a rock with the smeared remains of a segmented animal – a trilobite. 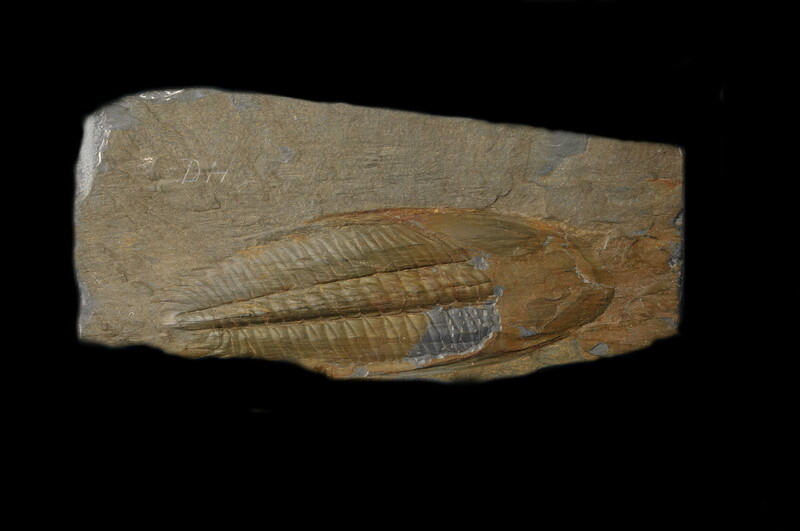 This trilobite is over half a billion years old and was found in Cambrian rocks in Wales. Sedgwick would, I’m sure, be proud to know that the name Cambrian, which he gave to these rocks in Wales is still used to day. He would be equally proud of the trilobite in his hand, because it is Sedgwick’s trilobite – named Angelina sedgwickii by John Salter in 1859. Look in nearby showcases and you can find the original specimen upon which the bronze was based. This slightly larger-than-life statue of Sedgwick was commissioned by Professor McKenny Hughes for the opening of the Sedgwick Museum’s new building in 1904. To commemorate one of the leading geologists of the 19th century; a man who was such a prominent figure in the University; and who did so much to build up the museum’s collection, only one of the finest sculptors in Britain could be trusted with such an important commission. The man who was chosen was Onslow Ford. Born in 1852, Ford was acknowledged as “one of the pillars of the sculptural renaissance in the 1880s and 1890s”. A member of the Royal Academy, he was, in appearance, “a dandy … proud of his beautiful moustache”. But he was certainly popular with his peers, being thought of as “the gentlest and kindest of human beings”. Ford is best known for his masterpiece, the memorial to Percy Bysshe Shelley, acknowledged as the most ambitious Victorian figure sculpture in Oxford, and the centerpiece to the Shelley Memorial building. A prolific creator of statues, bronzes and busts, Ford’s statue of Sedgwick was to be his last work. Engraved on the base of the statue is his signature and the date – 1901, the year he died.